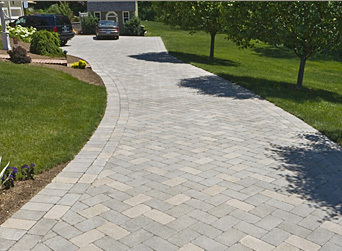 Concrete pavers are the perfect solution for the practical necessities of a hard-working driveway. Resistant to stain, frost and traffic, beautiful concrete pavers make a customized driveway that is more than just a place to park. EARTHWORKS has focused on installing concrete paver hardscapes for over 15 years, specializing in patios and driveways for residential and commercial installations. Home | About Us | Contact Us | FAQ | Testimonials | Photo Gallery | Walkways | Driveways | Pool Decking | Patios ©2008 EARTHWORKS, The Concrete Paver Specialists. For more information on Unilock products, click here.